National monument or Monas is located right in the center of Jakarta. Monas Monument is a pride of Indonesian nation. 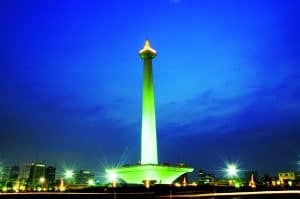 In addition, Monas is also one of the central tourist destination and educational centers that appeal to the citizens of Indonesia. Both in Jakarta and outside Jakarta. The purpose of Monas development is to commemorate and perpetuate the greatness of the struggle of the Indonesian Nation known as the Revolution of 17 August 1945. The idea of Monas development came after nine years of independence. A few days after the 9th Victory Day, a committee was formed to establish Monas Monument. The committee was led by Sarwoko Martokusumo, S Suhud as the writer, Sumali Prawirosudirdjo as treasurer and assisted by four members of each Supeno, K K Wiloto, E F Wenas, and Sudiro. The committee was formed to prepare everything related to Monas development. Monas was planned established in the middle of Medan Merdeka field, Jakarta. Including collecting the construction costs that must be collected from self-help communities. Monas development committee called “Team Yuri” chaired by President of Indonesia Ir Soekarno. Through this team, the competition is held twice. The first competition was held on February 17, 1955. The second contest was held May 10, 1960 in hopes to produce the highest cultural work. And can describe the nobility of Indonesian culture. can produce cultural works that inspire the spirit of heroism. monument must be built from objects that are not rapidly changing and hold for centuries. However, twice the contest was held, there is no design that meets all the criteria set by the committee. Finally, Team Yuri chairman appointed several prominent architects, Soedarsono and Ir F Silaban to draw the monument plan of Monas. Both architects agreed to make their own pictures which then submitted to the chairman of Team Yuri (President Soekarno). Then the chairman chooses a picture made by Soedarsono. Soedarsono is the one person who render a service of history of Monas. Soedarsono put forward the rationale that accommodates the wishes of the committee. The foundation of that thought includes the National criterion. Soedarsono took some elements during the Proclamation of Independence that embodied the national revolution. And as much as possible apply it to the architectural dimensions of the numbers 17, 8, and 45 as the number of Day Proclamation. The towering form of the monument contains the philosophy of “Lingga and Yoni” which resembles “Alu” as “Linga”. The shape of the container of the room resembles “Lumpang” as “Yoni”. Alu and Lumpang are two important tools owned by every family in Indonesia, especially rural people. Linga and Yoni are symbols of antiquity that depict eternal life. Positive elements (phallus) and negative elements (yoni) such as the existence of day and night, male and female, good and bad, is the eternity of the world. The entire shape of the architectural lines of the monument embodies moves that are not monotonous evenly, rising curved, jumping, evenly again, and rising towering, eventually waving over the form of a flaming fire flame. Body of the monument towering. The flame of fire at its peak represents a burning and unflagging spirit in the Indonesian nation. Monas monument construction is implemented through three stages. The first stage (1961-1965), the second (1966-1968), and the third stage (1969-1976). In the first phase of implementation of its work under the supervision of the National Monument Committee. The costs used are sourced from community contributions. The second stage of his work is still under supervision of the committee of Monas. However, the cost of development is sourced from the Central Government Budget, namely the Secretariat of State of the Republic of Indonesia. In this second phase, development is sluggish, due to limited cost. The third stage of the implementation of the work is under the supervision of the National Monument Board of Trustees. The cost used is sourced from the Central Government, namely the Directorate General of Budget. This budget was launched through Repelita by using Project List (DIP). The monument was officially opened to the public and inaugurated on 12 July 1975 by the President of the Republic of Indonesia Soeharto. The construction site of this monument is known as Medan Merdeka. Monas Square experienced five renamed Gambir Field, Ikada Field, Merdeka Square, Monas Square, and Monas Park. Around the monument there are parks, two pools and several open-air gyms. In the Merdeka Medan holidays filled with visitors who enjoy the scenic view of Monument Monument and perform various activities within the park.